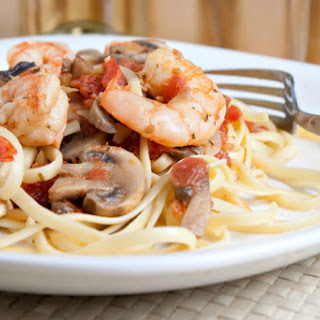 This Champagne Shrimp Pasta has become a regular feature on the restaurant menu on special days, such as Valentine's Day and Mother's Day and New Year's Eve. 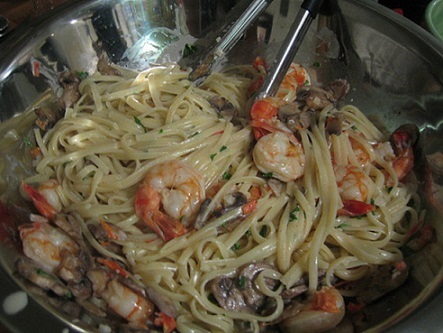 Restaurant guests have requested this elegant shrimp pasta recipe many, many times. It is delicious and then they are surprised to find out how easy it is to prepare. With a champagne-cream sauce, this makes for a great romantic dinner anytime of the year, especially on Valentine's Day. You'll have enough champagne left over, you and a loved one can toast to each other’s love and health in candle light. I discovered this recipe years ago and have tweaked it several times since. The champagne mingles nicely with the cream to create a wonderful sauce. Using minced shallots provides a touch of onion-garlic flavor. You can add a little minced garlic to give it some extra "zip," if you want. And sometimes I use basil in place of the parsley. Note: Shallots are not really onions and should not be confused with green onions or scallions. They have a mild taste combining the flavors of sweet onion and mild garlic. To peel the tomato, place in boiling water until the skin begins to pop. Remove the tomato with a slotted spoon and let it cool. Cut the tomato into quarters and remove the seeds with a small spoon. Have all ingredients measured and vegetables prepared before beginning. I like to cook the pasta ahead of time in which case it needs to be tossed with a small amount of olive oil to prevent it from sticking together. Before serving this wonderful dinner, prepare a delicious salad. Also, the restaurant guests and I like to have a slice of garlic bread with this meal. 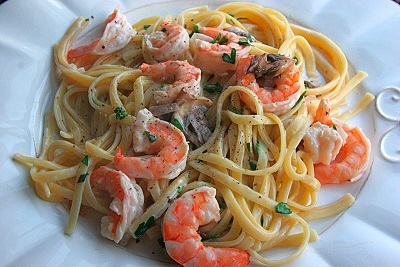 Enjoy your Champagne Shrimp Pasta and the company of those you share it with! “Anyway, like I was sayin', shrimp is the fruit of the sea. Dey's uh, shrimp-kabobs, shrimp creole, shrimp gumbo. Pan fried, deep fried, stir-fried. There's pineapple shrimp, lemon shrimp, coconut shrimp, pepper shrimp, shrimp soup, shrimp stew, shrimp salad, shrimp and potatoes, shrimp burger, shrimp sandwich.